The Game Wizard Xtreme is the most advanced arcade machine in the market. it is Australia’s first multi-platform arcade system with a patent pending design. 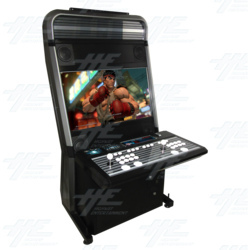 Arcade Gaming: multiple power supplies, harnesses and internal adapters means that you can play almost all game boards – from early classics, to late model JVS/USB gaming boards such as Namco 357, Taito X3 and so on. All plug and play. Old School Gaming: just want to add your own “combo board”. No problem, just plug into the existing Jamma harness and start playing. Advanced Console Gaming: allows plug and play of Xbox 360, Xbox One, PlayStation 3, PlayStation 4, PC, Raspberry Pi, Android, and now Nintendo Switch consoles in your cabinets. Enjoy the widest range of games on your Game Wizard Xtreme machine. Regular firmware updates to ensure future console compatibility and continuous improvement to software. When new consoles are released, upgrade (free) your Xtreme machine to the latest console with firmware update. The Game Wizard Xtreme uses the HIGHWAY IO board, a custom designed IO board supporting the widest range of gaming options. Why buy pretend arcade machines which will sit in a corner of your games room, when you can have the highest end gaming machine and played daily. Play the way you want, when you want – everything in the Game Wizard Xtreme is ready. Price includes 2 commercial swivel stools, spare parts and everything ready for your gaming experience.